Researches on the results of surgical treatment of thoracolumbar spine fractures are infrequent. The aim of this study was to determine midterm outcomes of surgical treatment of these fractures in a prospective survey. A case series study on pediatric patients with the diagnosis of thoracic and/or lumbar vertebral fractures was conducted over a ten-year period. Surgically treated patients were evaluated in the follow-up period, based on back pain, independent function, neurological status, and radiographic indices. There were 102 pediatric individuals, 61 boys and 41 girls, aged 3–17 years (mean 12 years of age) with thoracic and/or lumbar spinal fractures. Motor vehicle accident was the most common mechanism of injury (45.0 %). L1 was the most frequent level of fractured vertebra (24.4 %), and pelvic fracture was the most common associated orthopedic injury (21.5 %). Totally, 20 patients underwent surgery, but only fifteen (14 boys and one girl) participated in follow-up (mean 49 months; range 12–81 months). Posterior spinal fusion and instrumentation was accomplished in 12 cases. Three patients were operated by anterior approach and fusion followed by posterior fusion and instrumentation because of delay in diagnosis. There were no major perioperative complications. Two cauda equina syndromes and two incomplete spinal cord injuries improved back to normal. Five cases (33.3 %) reported occasional back pain, and all patients were functionally independent. Radiographic indices improved significantly. Spinal fusion and instrumentation in pediatric patients with unstable thoracolumbar vertebral fractures with or without spinal cord injuries have favorable radiographic and functional outcomes. The study was carried out in Bone and Joint Disease Research Center, Department of Orthopedic Surgery, Chamran Hospital, Shiraz University of Medical Sciences, Shiraz, Iran. 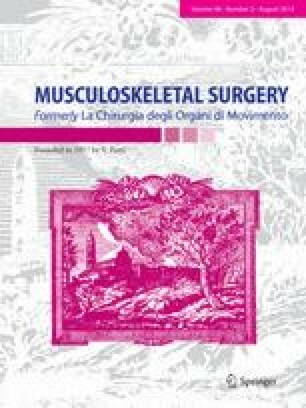 This article has been extracted from a thesis submitted to Shiraz University of Medical Sciences in partial fulfillment of the requirement for the degree of specialty in orthopedic surgery. Source of funding is Bone and Joint Disease Research Center of Shiraz University of Medical Sciences.